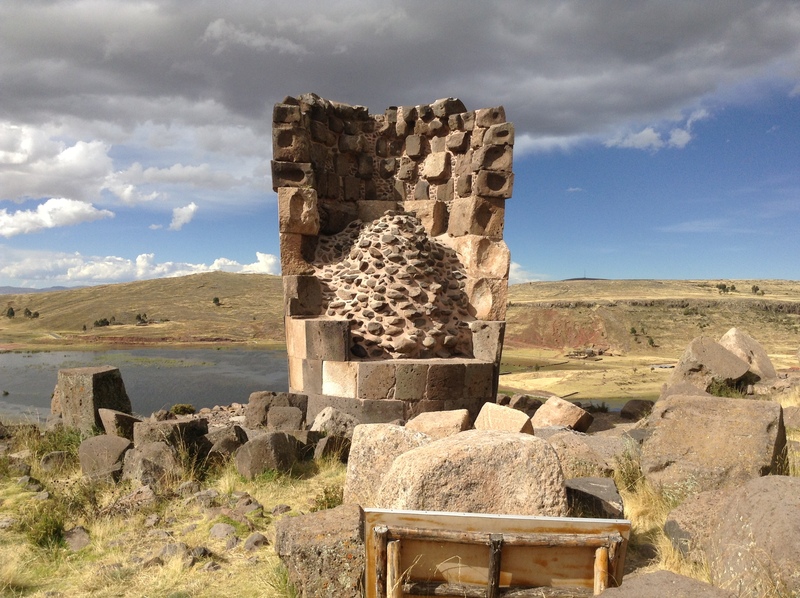 Continuing our pre-Inca and Inca cultural immersion, one of today’s highlights was a visit to the ruins of Sillustani, a burial site consisting of funerary towers located on a lakeside peninsula high in the Andean plateau. 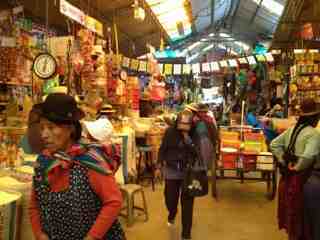 Before contemplating death, however, we had a chance to experience contemporary Peruvian life by visiting a market in Puno. Cheerily chaotic, this huge indoor bazaar caters to Puno’s 160,000 residents, with vendors in traditional Andean clothing selling everything but the kitchen sink. And I mean everything. Toilet paper, soap, produce, fish from Lake Titicaca and the Pacific Ocean, bulls’ heads (yes, it’s true), tripe, herbs, sweets for ritual offerings to Pachamama – you name it, you could find it here. Although we only spent a short time exploring the stalls, it was easily one of the trip’s highlights. After spending nine days living mostly in the past, we were thrown into bustling present-day Peru, and it was a treat to see it in action. Back to death and Sillustani, which is essentially a very unique graveyard. 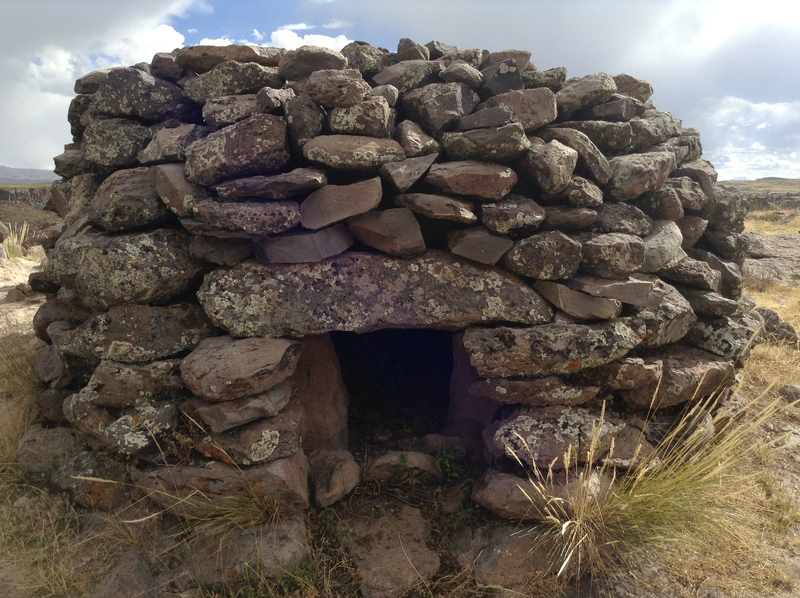 Bodies were first buried here by the pre-Inca Colla tribe in the first half of the 15th century. Rejecting underground graves, which prevented the dead from successfully making it to the afterlife and into the warm embrace of Pachatata (Father Earth), the Colla people built primitive cylindrical towers made of stone into which they would lower the bodies (usually of the same family). The still-living would then seal the tower for eternity, except for a very small opening at the base that would allow the air to circulate and prevent decomposition. Soon after the Colla started using these towers, the Incas arrived. And as we’ve come to learn on this trip, Inca is synonymous with excess. New towers had to be constructed on a much grander scale – i.e., taller structures built with gigantic, polished stones that fit together perfectly. Needless to say, the site happens to be a great example of how the Incas often showed up, co-opted the methods of the tribes they conquered, refined those methods, and got all the credit in the history books. After building the exterior towers, which were the epitome of harmony from the outside, the Incas would place the bodies inside and surround them by an inner dome-shaped chamber of smaller rocks that were piled on haphazardly. 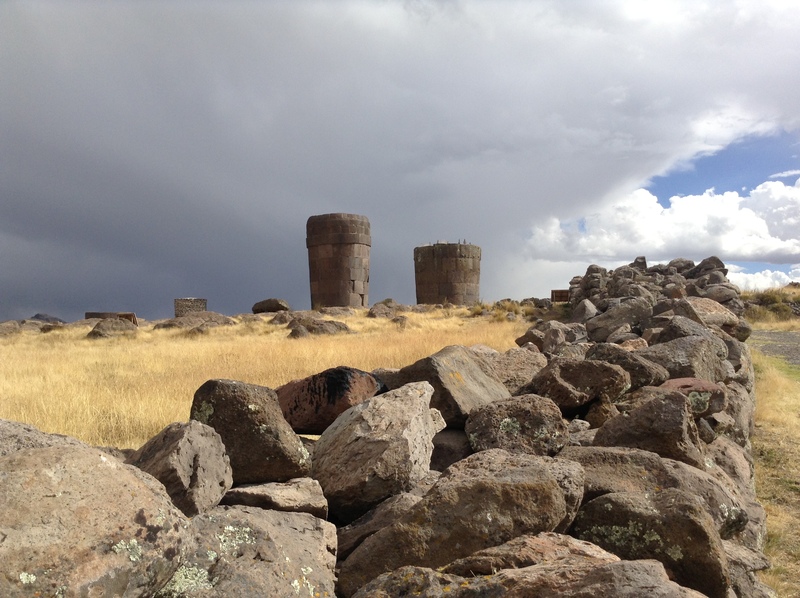 The tower in the photo above, which at 46 feet high is the largest structure at Sillustani, shows both the exterior wall and interior dome. It housed the bodies of a noble, his family and his servants. The mummification process is fascinating. After removing the dead person’s organs and disposing of them, the body would be filled with alpaca and llama dung to prevent shrinkage, and covered in lemon thyme and mint to repel the bugs. Why was animal poop a necessary ingredient for mummification? A hollowed-out, shriveled body would not bode well for a happy afterlife. Once properly mummified, the intact corpse would be placed in a fetal position so it could properly return to the “womb” in preparation for its next adventure. As I was meandering among the ruins, I thought more about these centuries-old burial traditions, especially the positioning of the body like a fetus in the womb. There’s something very reassuring and natural about going to one’s final resting place in that way. Really, when you’re dead, who wants to be laid out stiffly like an ironing board in a totally useless suit or dress when you have the opportunity to curl up like a baby instead? These South American cultures were smart and perceptive in so many respects. They understood that birth and death are part of the circle of life. And instead of fearing death, and turning death into a circus, they embraced it. And with this last excursion to the burial ground, we appropriately wrapped up the Inca segment of our trip. Tomorrow, it’s off to the Amazon, where I am hoping against hope that I’ll meet a monkey (perhaps an Inca prince in a previous life) that will pose for some photographs. Previous PostThe Land of Lake TiticacaNext PostThe Amazon!